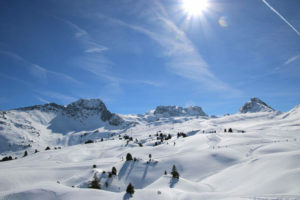 Paradiski is La Plagne and Les Arcs in France – the combined two ski resorts make the second biggest linked ski resort in the world, behind Les Trois Vallées also in France. Paradiski encompasses skiing on two glaciers, a total of 425 kilometers of trails, and high elevation skiing at Aiguille Rouge of 10,583′. La Plagne has four high elevation villages, Plagne Centre, Plagne Villages, Plagne Bellecote, and Belle Plagne, while Les Arcs has three village areas, named for their elevation in meters- 1600, 1800, and 2000. 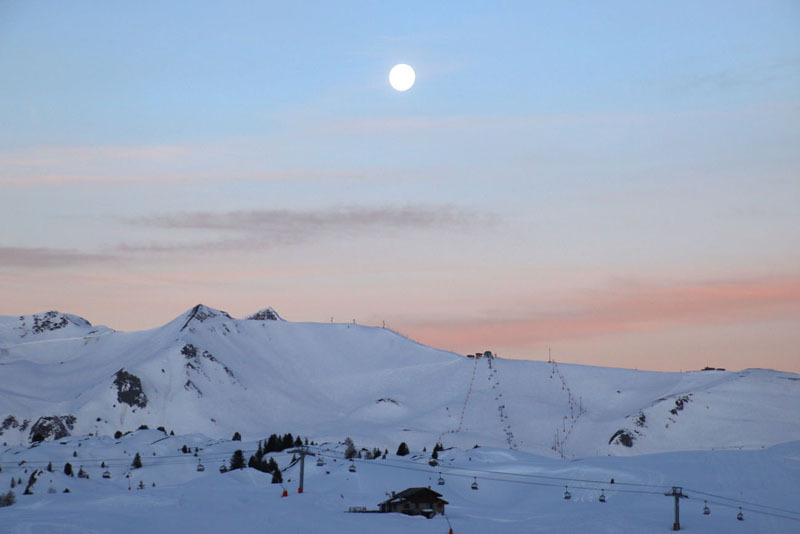 La Plagne is huge, playful ski terrain with tons of fun parks for the kids, plenty of groomed intermediate trails, some crazy off-piste terrain, glacier skiing and beautiful view of nearby Courchevel. La Plagne is however not so charming chalet. Much of the mountain architecture is 1960’s – unattractive big buildings. But you came to ski – there’s tons of skiing – 425 kilomteres of trails. la Belle Plagne – the highest mountain village at 2050 meters is the prettiest as well, with big chalet style apartments and a few casual après ski bars, stores and restaurants in the village center. Kids can go sledding or the family can snowmobile after the ski lifts close from this central location. While La Plagne lacks alpine authenticity and warmth, you can get deals here. 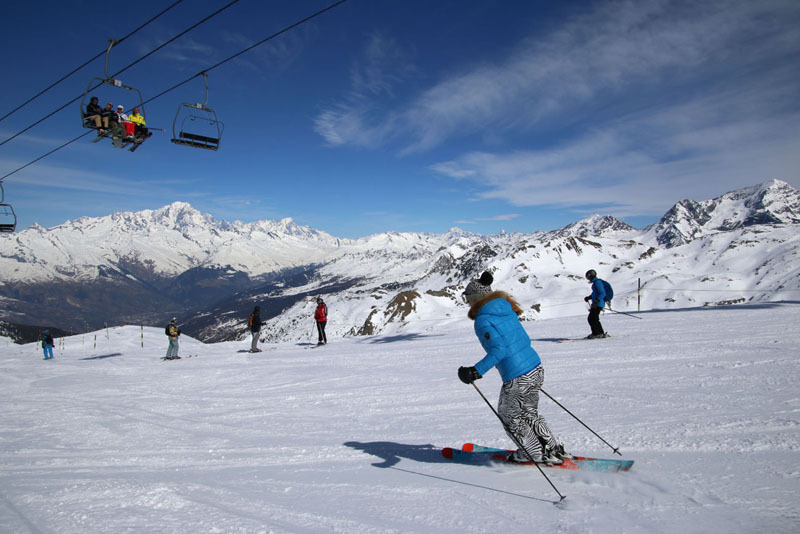 Warning: La Plagne does get crowded, with so many big lodging properties, so expect lift queues and be wary that popular trails can be loaded with skiers. What Paradiski doesn’t deliver in ski village sophistication, it makes up for in adventuresome skiing, and tons of groomed pistes for intermediate skiers, fun parks for kids, and off-piste undulating big mountain terrain, some of the terrain looks almost lunar with sink holes and swirling bowls, still in sight of the lifts. Be aware at all times of the changing terrain, and consider hiring a ski guide. The ski lifts launch in every direction, often intersecting at a peak after crossing over another six or eight passenger chair. La Plagne’s old gondola up the summit glacier is popular for sightseeing as well as skiing. You can see the summit of Courchevel in Les Trois Vallees and the Olympic Nordic ski jump at La Praz in perfect view on a clear day. La Plagne played its part in the 1992 Winter Olympics hosting the bobsled. Today, La Plagne hosts many ski events in its big race stadium at Bellecote Plagne. 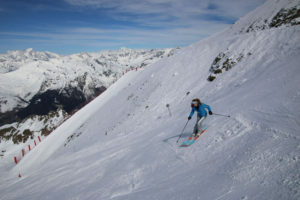 The connection between La Plagne and Les Arcs is just one lift – an amazing double-decker tram at the far corner of each resort. Les Arcs offers up extraordinary views of Mont Blanc. Here you have more funky architecture, and lots of red and blue runs – for beginners and intermediate. The tram to the summit of Aiguille Rouge delivers you to the highest point at Paradiski – 3228 meters with breathtaking views, and some crazy take-your-breath-away off-piste runs so beware. Otherwise there are two marked groomed runs all the way down. Les Arcs formerly hosted the speed skiing stadium on this peak. Paradiski is where the masses ski, it’s a bit busy – some call it a ski factory, but everything is ski in ski out, and a bargain compared to nearby Courchevel, Chamonix and Val D’Isère.